Her work has shaped nursing around the world and now her efforts have been lauded by Prince Charles. Associate Professor Stacy Johnson, of the Faculty of Medicine and Health Sciences at the University of Nottingham, has been officially appointed Member of the British Empire (MBE) for services to healthcare and Higher Education. 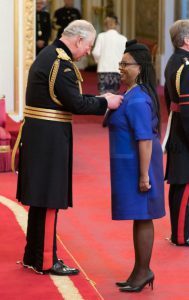 HRH Prince Charles presided over the investiture ceremony where the inspirational teacher and champion of equality rubbed shoulders with celebrities and other honours recipients. She added: “He asked me where I worked and I was thrilled to say that I worked across the whole NHS and taught nurses, midwives and other health professionals at the University of Nottingham. This really is my dream job. Dr Johnson’s mother and father, Kelva and Joel travelled from her native Trinidad for the ceremony and she was also joined by her sisters Michelle and Dyneshia. Another highlight for the award-winning lecturer was meeting the other MBE and OBE recipients. She said that they were an impressive and inspiring group. “I spoke at length with TV personality David Grant, awarded an MBE for services to music. We discovered that we had a common interest in youth and BME leadership development. We are now following each other on Twitter and I will definitely be in touch with David to see how we can work together. As I walked into the ballroom, I stood between a distinguished nurse and a young stroke survivor honoured for raising money for stroke charities. Dr Johnson has been a member of England’s Chief Nursing Officer’s Black and Minority Ethnic Group since 2012, advising on issues affecting BME patients and staff. She also lectures on and researches into the areas of healthcare leadership, innovation and entrepreneurship. She has developed an exemplary reputation for capacity and capability building in the international Higher Education arena. She leads the School of Health Sciences’ strategy on international leadership and is a visiting lecturer at the Henan University of Science and Technology in China. She has been involved in advising on curriculum reform, faculty development and leadership development in nurse education in the UK, South Africa, China, the Middle East, India and the Caribbean.